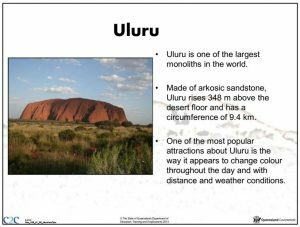 Recently, a teacher from a Christian school asked for help with a year-8 geography class studying landforms and landscapes. It was part of the Australian National Curriculum, and the teacher had a powerpoint presentation they needed to show the students. They asked if I could check the powerpoint because they realised the material was not presented from a biblical perspective. 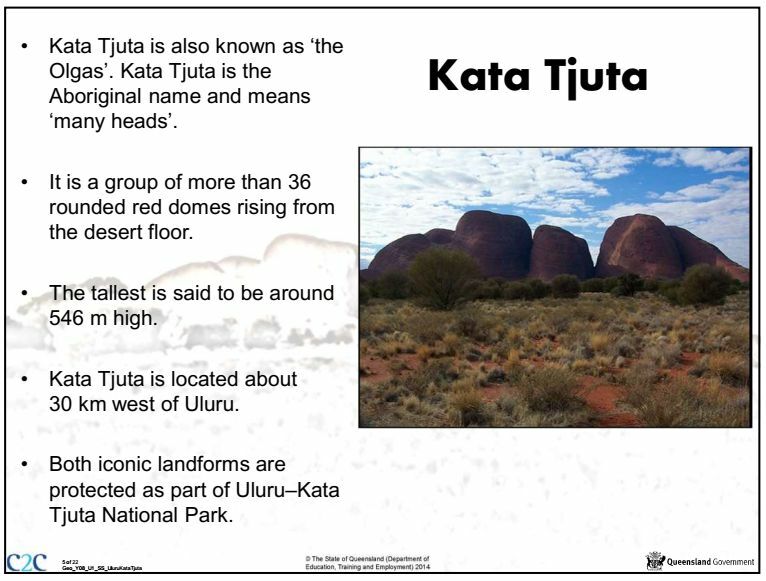 The powerpoint was about Uluru (Ayers Rock) and Kata Tjuta (the Olgas), which are two geographical icons of Australia. What was OK, and what did they need to correct? 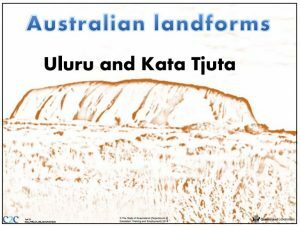 Landscapes provide remarkable visual evidence for Noah’s Flood, and I have already prepared brochures about Uluru and Kata Tjuta, that explain these evidences. Uluru and Kata Tjuta are in the centre of Australia, also known as the Red Centre. 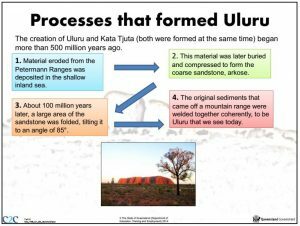 I wrote an article about the geology of the Red Centre explaining how the geological evidence reveals Noah’s Flood. There are four videos in that article that deal with specific sites and explain how the evidence is consistent with the Flood. 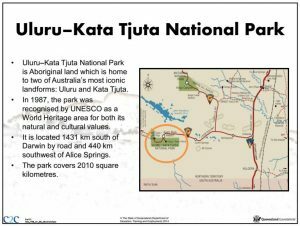 Here I reproduce the powerpoint provided for the geography class, along with comments on the way the evidences is presented. I hope it will be helpful for other teachers. Slide 1. 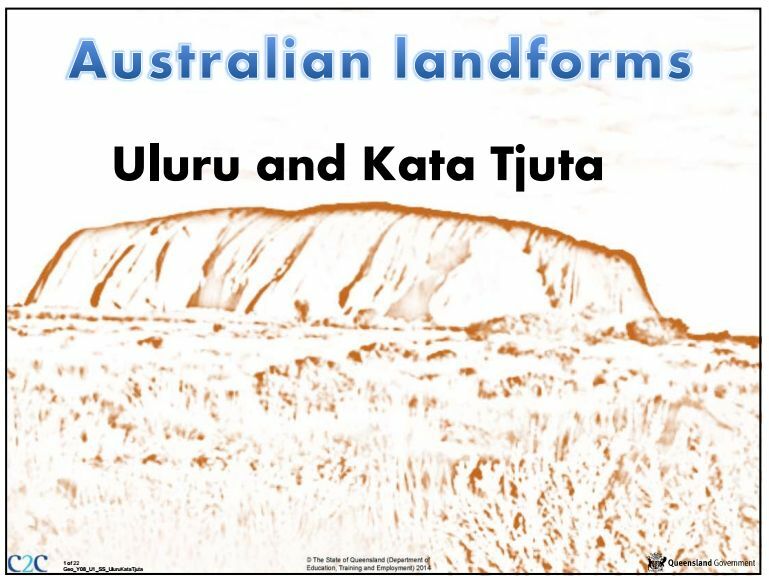 It's s drawing of Uluru and obviously factual. Slide 2. Location. All factual. Brown is high elevation. The information can be confirmed from various sources. 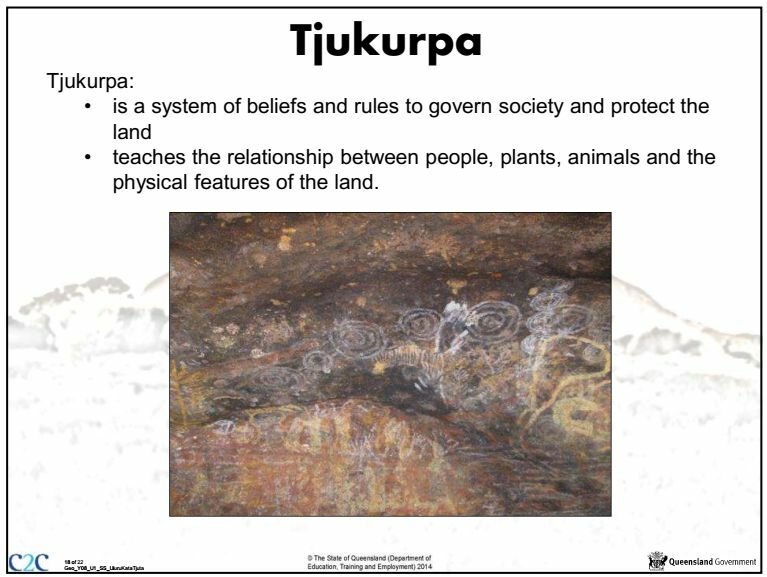 Slide 3. It has some historical information, all based on events that were witnessed in recent history and that can be checked. 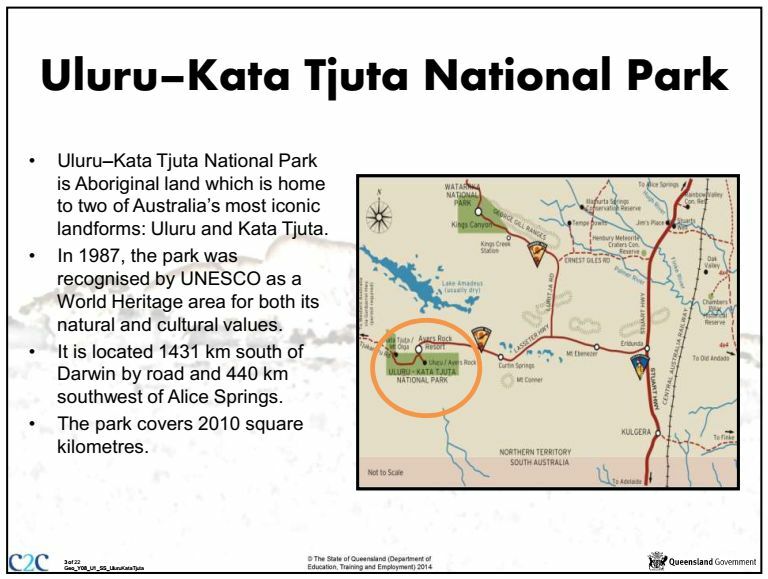 It has some geographical information that can be checked too. All factual. Slide 4. 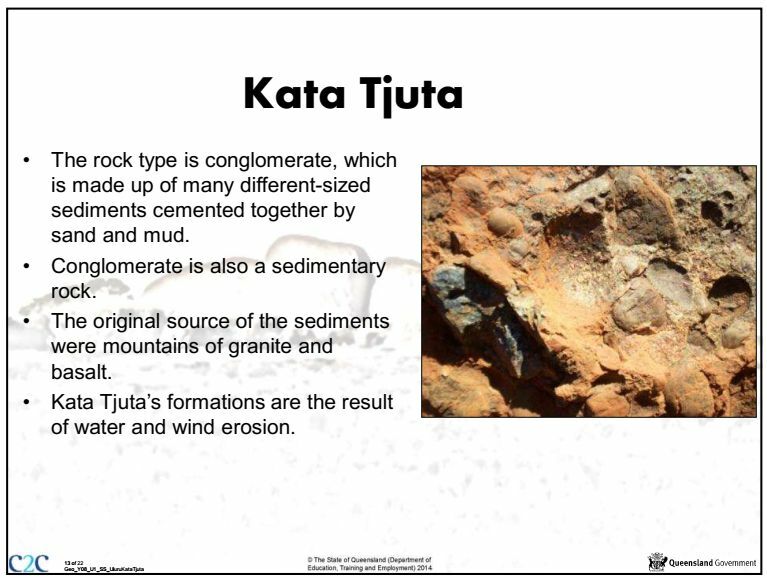 Some geological facts are presented. 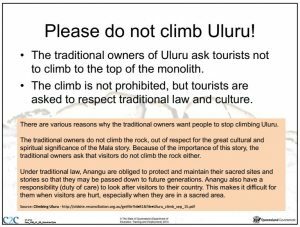 These can be checked from many sources, including a visit to the rock. All factual. Slide 5. This is more factual information. The details can be checked by other sources. The term "is said to be" is curious. It is not that the height is based on someone's opinion. It presumably has been measured. The height can also be checked using tools such as Google Earth. Slide 6. Basically this is factual information. 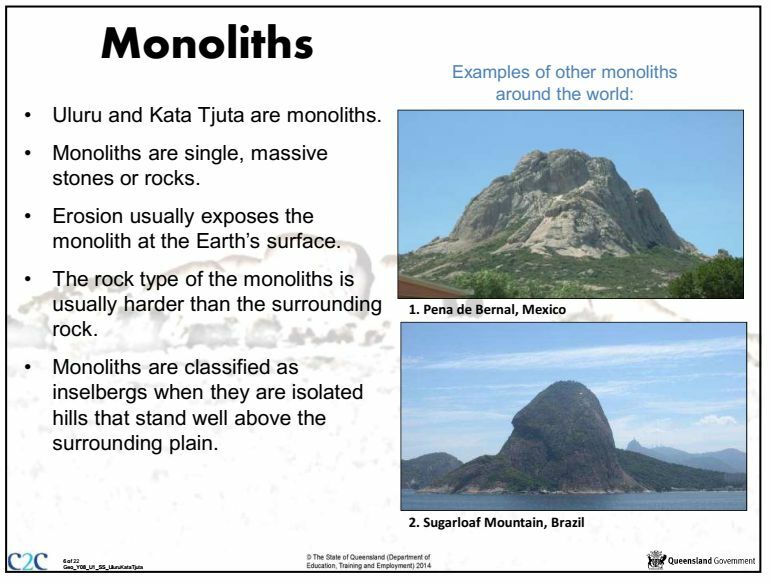 A monolith is a single rock. 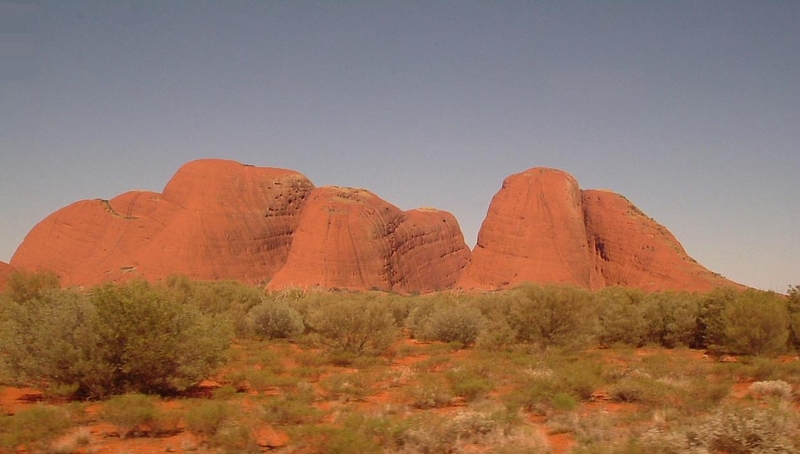 An inselberg is an isolated hill or mountain rising abruptly from a plain. The uniformitarian philosophy assumes that the Rock was eroded by millions of years of weathering by the sorts of processes we observe today. The biblical interpretation is that the Rock was eroded by the waters of Noah's Flood. Significant erosion would have occurred as the waters were rising. The last period of erosion would have been when the waters of Noah’s Flood were retreating. The article Australia's remarkable Red Centre explains the various periods of erosion of the area during the Flood. There is a good article about inselbergs in Creation magazine 39(1), discussing how the retreating stage of the Flood eroded them. Even though Uluru is a single rock, it is only the tip of the 'iceberg'. 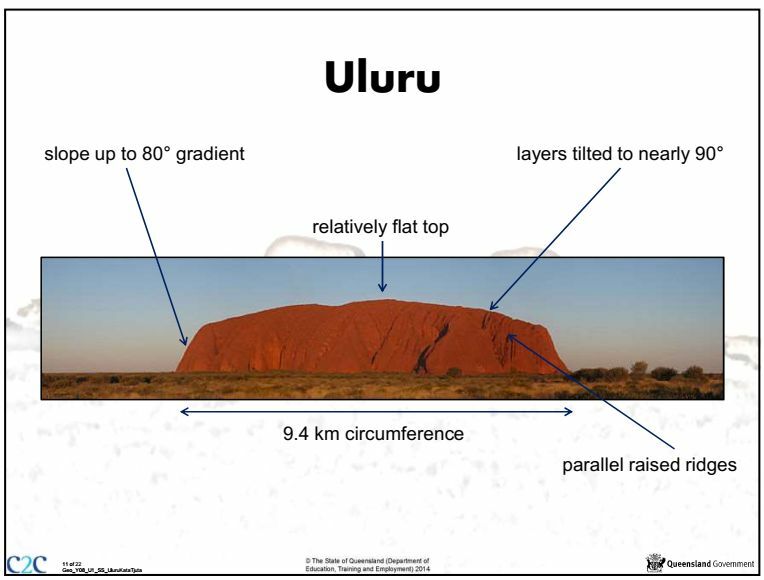 The brochure on Uluru has a geological section showing how far it extends beneath the surface. Slide 7. The dates of millions of years are wrong. They are not objectively measured but based on assumptions based on their long age philosophy. 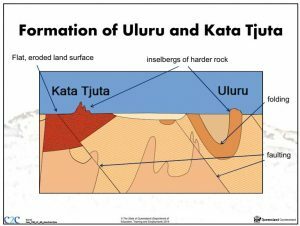 This is discussed briefly in the article on the Red Centre under Section1: The geology of Central Australia. 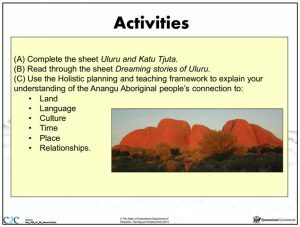 The students need to understand the different assumptions behind the two different explanations. The idea of millions of years comes from the commitment to rejecting events recorded in the Bible and thus not accepting that there was a global Flood. So they assume it happened by the sort of slow processes we see happening today, and so they assume it must have taken millions of years. If we accept the Bible that the global Flood happened as it records, we conclude the geological processes happened quickly due to the catastrophic processes of Noah’s flood. The general processes described in the boxes in this slide are reasonable. The 'welding' mentioned in box 4 likely occurred as a result of the processes described in box 2 & 3. All these processes occurred during Noah’s Flood. Slide 8. The processes described here are reasonable. It all occurred during Noah's Flood. An interesting question that arises is what happened to the 'slabs of rock" that flaked off, and the other eroded material. 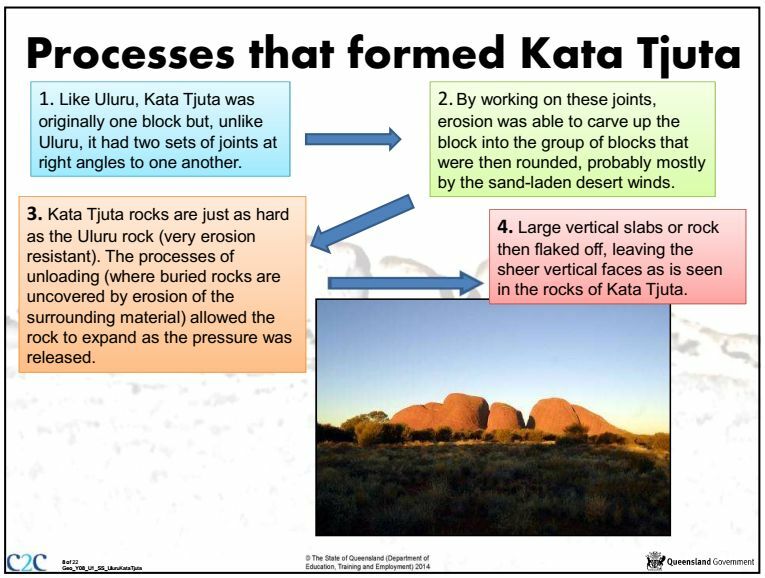 If the erosion was by slow and gradual weathering the materials should be mostly still around the rocks. But it has been carried out of the area, and the retreating waters of Noah's Flood account for that. 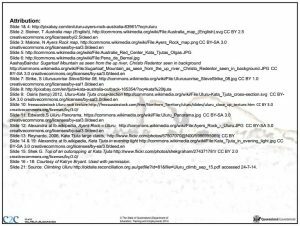 Slide 9. 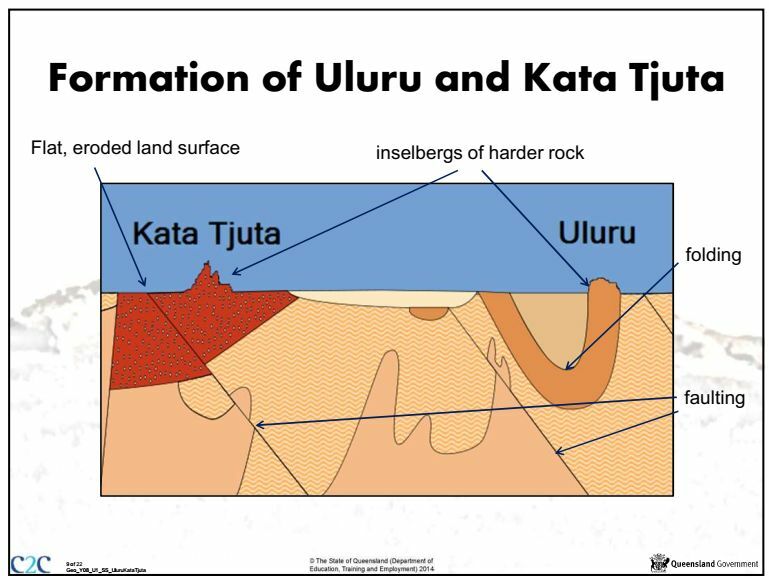 This is an interpreted geological cross section illustrating what geologists think the rocks are like underground. The section does not impinge on the question of how the rocks formed, but the section can be used as the basis for an explanation that is constructed to explain the origin, whether it is a uniformitarian explanation or a biblical one. However, note that geologists do not know what the rocks are like under the ground, they are only speculating. 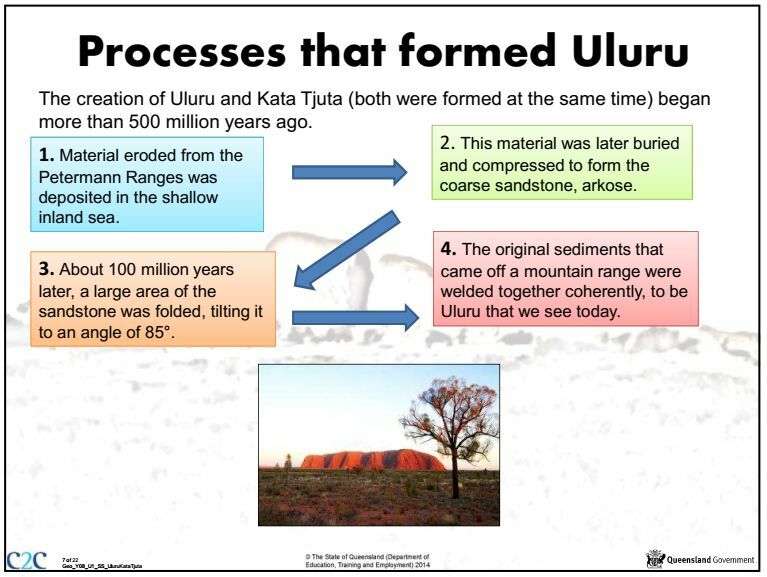 In fact, the latest geological thinking has developed a different scheme, and that is illustrated in Figure 3 in the brochure on Ularu. You can make a good point to illustrate that even in issues in the present there can be different ideas. This can be used to encourage students to question everything. Slide 10. This is quite reasonable. The "mountains" of granite that were eroded were formed early in Noah's Flood, and they were eroded in the Flood, quickly. 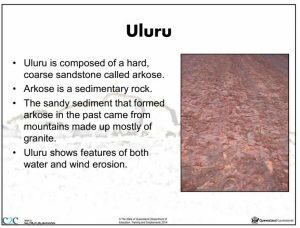 The brochure on Uluru and the other articles above discuss evidence for rapid deposition of sediment, including the shape of the sand grains, the size distribution of the grains, and the mineral composition of the grains. Slide 11. Factual information that can be confirmed by observation. Slide 12. Factual information that can be confirmed by observation. The word “long” can mean different things to different people. To the uniformitarian it can mean millions of years. To the biblical geologist it can mean thousands of years. Notice how there is very little eroded rock that lies around the base of Uluru. 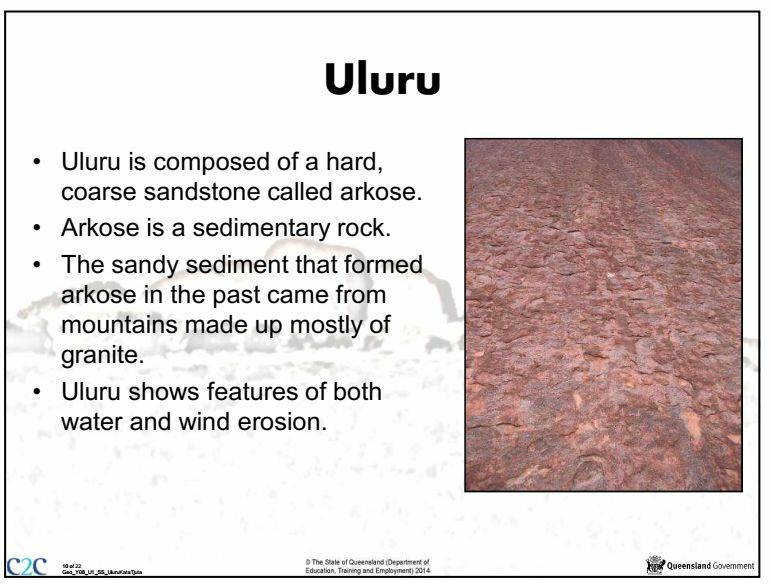 In other words the eroded material has been carried out of the area, and there has not been much erosion since. This is consistent with erosion occurring during the Noah's Flood catastrophe, and not much happening in the 4.500 years since. 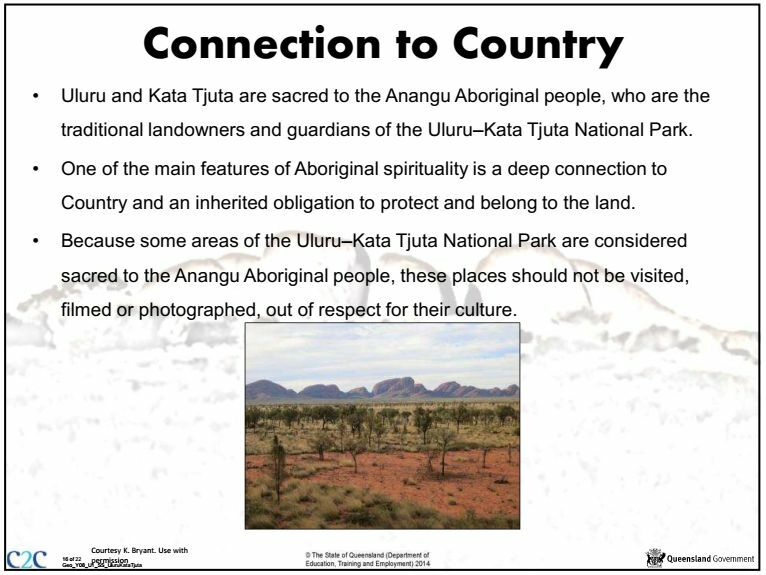 This concept is discussed in the brochure and in some of the videos on the Red Centre. Slide 13. Note the size of the conglomerate boulders, which can be half a metre or more. 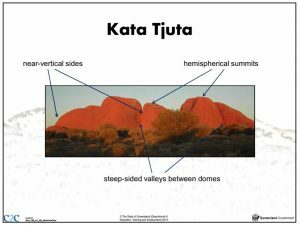 There are better photos the articles on creation.com, including the brochure on Kata Tjuta. 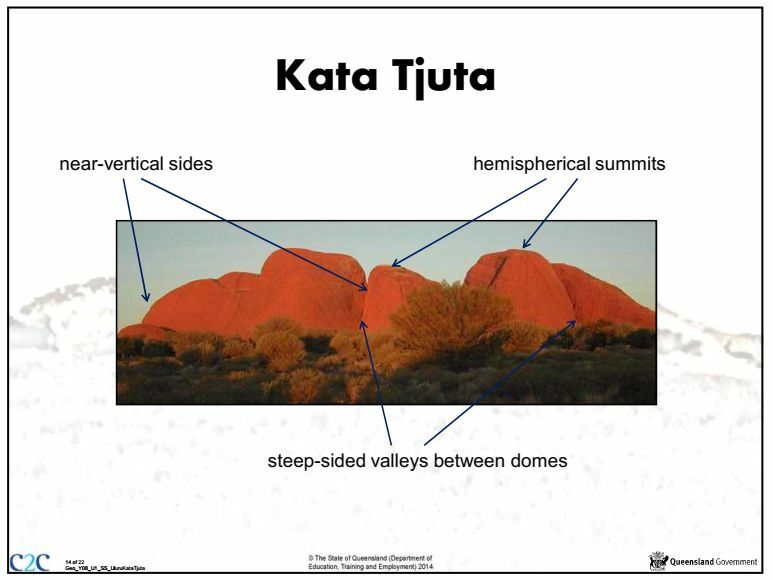 These large, rounded rocks are evidence for catastrophic transport by water. Water erosion is the main process. Wind erosion was only in the 4,500 years since the Flood, and would have been trivial. 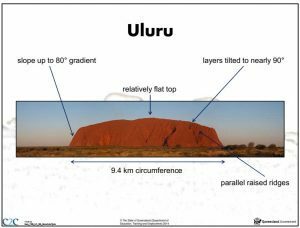 It's the same story as for Uluru that there is very little debris around the domes. Slide 14. Facts that can be confirmed by observation. Slide 15. Reasonable. 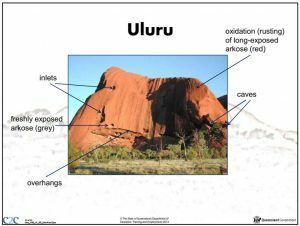 Has the chemical weathering actually been observed? Same with the sand blasting. Something to investigate. 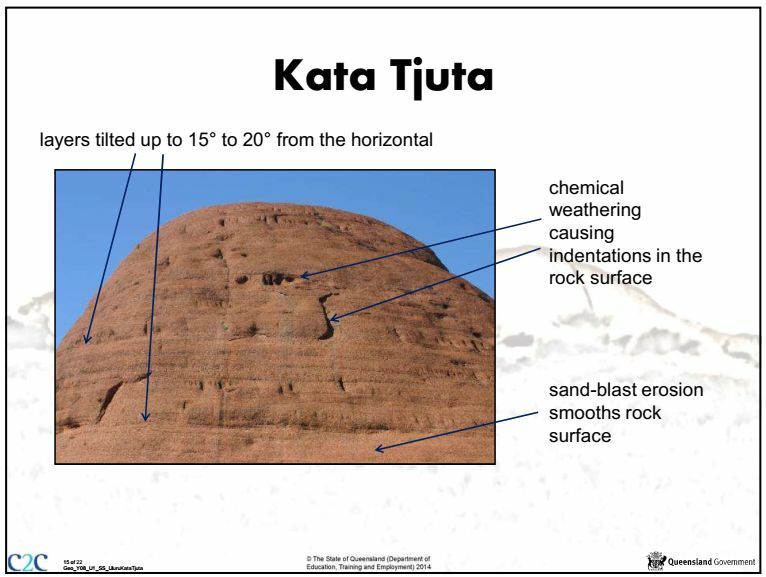 Most likely sand blasting just hardened the surface rather than removing any significant quantity of rock. Most of the erosion of the domes would have been during the Flood. Slide 16. 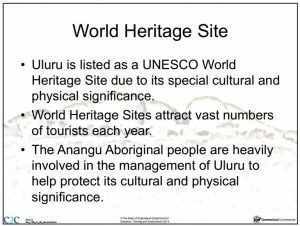 These seem to be facts about the Aboriginal people that could be confirmed by further investigation. In my view, I think there is a down-side to include these descriptions about Aboriginal spirituality without comment. There is a Christian spirituality that applies to the Rock that has not been mentioned. That is that we are to worship the true God who created the earth and rules over it, not the creation. Romans 1:18–23 talks about that. Slide 17. Ditto. 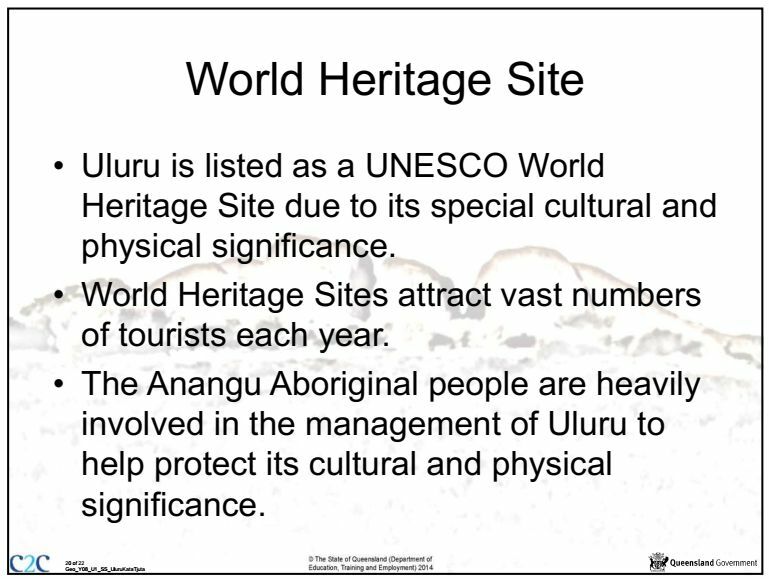 One important question from this is where the Aboriginal people came from? 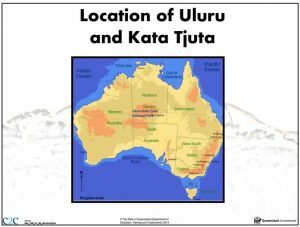 In the evolutionary view they have been in Australia for 60,000 years or so. However, in the biblical view they are descended from Noah the same as all other people. 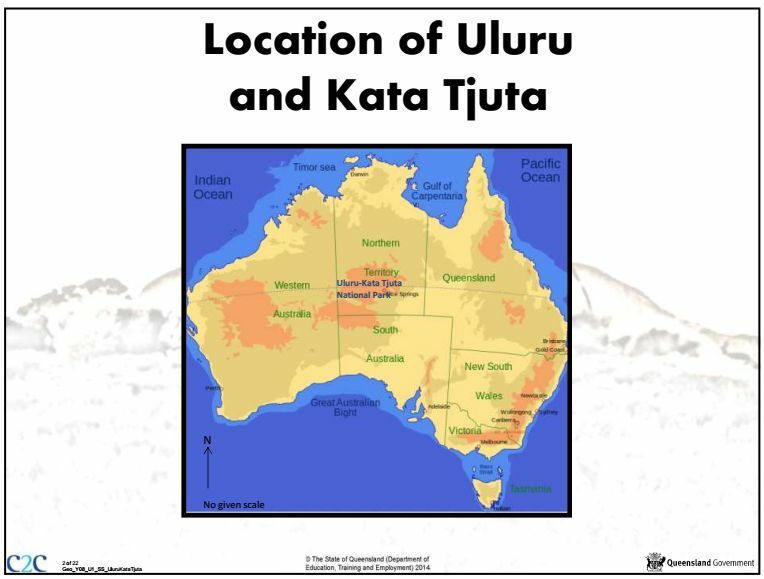 They migrated to this land less than 4,500 years ago. There is similarity of their facial features and language to the people in southern India. Like Noah and his family, they had a knowledge of the One True Creator God but have mostly lost it, although there is a small remnant in their memory. 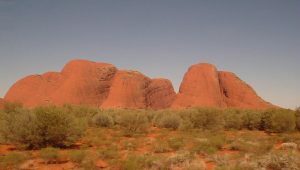 Creation.com has a few articles about Aboriginal Flood legends. 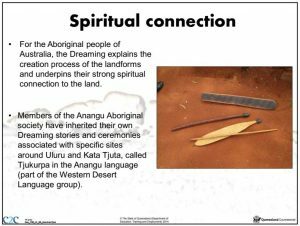 This tendency to reject God is part of the human condition, and is not confined to the Aboriginal people. 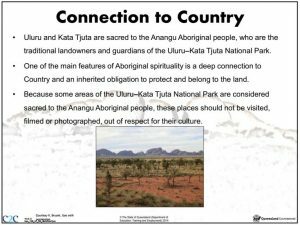 The absence of any reference to creation or the Flood in the Australian Curriculum, indeed the strident censorship of such ideas, demonstrates that such rejection is strong in mainstream Australian culture. Slide 18. 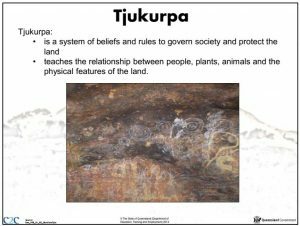 Tjukurpa. I am not familiar with this. 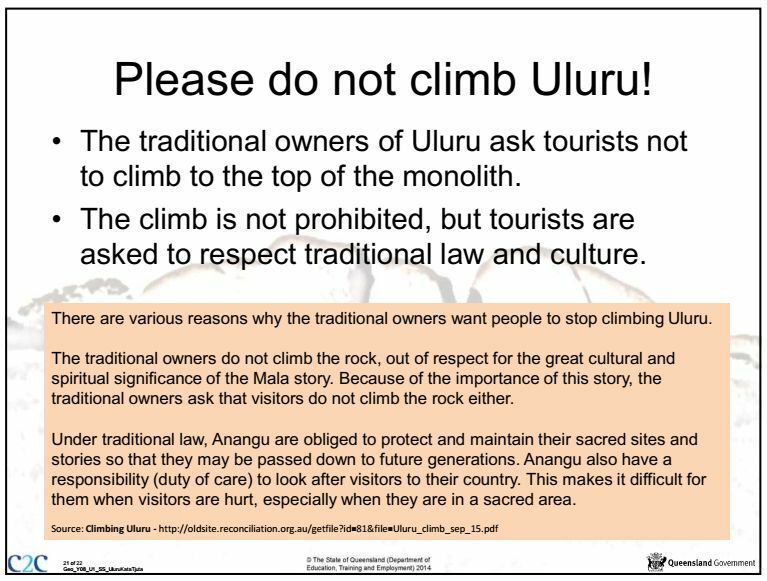 I understand some indigenous customs have helped preserve the culture and genetics. There are some pagan customs that are harmful. This is the same for every culture. I don’t know enough to add anything more. Slide 19. I do not know enough to comment. 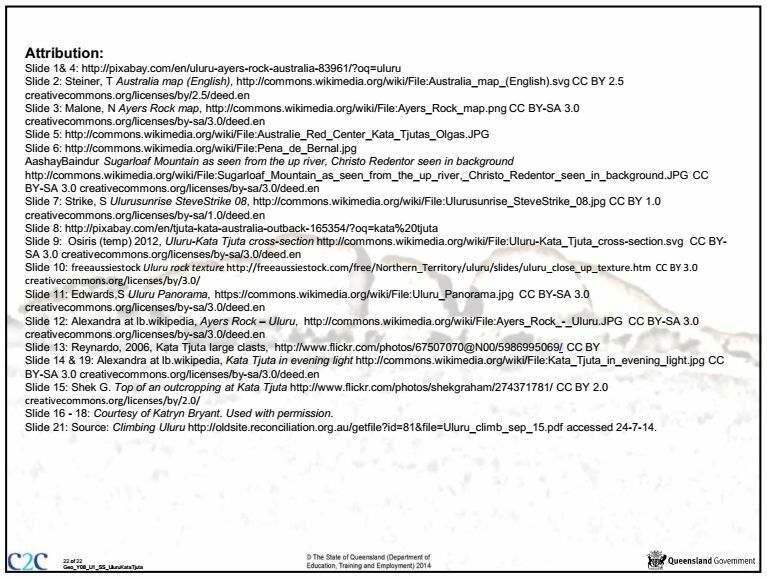 Slide 20. Just facts. No problem. Slide 21. This seem to me to be advocating a particular political agenda. From a Christian perspective all such cultural and religious views should be critiqued in terms of the revelation from the One true Creator God, who made the world, sent the global Flood, and created all people to have a relationship with Him. 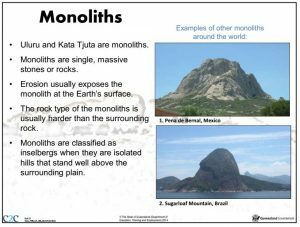 Your “interpretation” of geology is woeful and amounts to child abuse by using a mythological event to explain natural processes. There is ample evidence that suggests a 4.5 (or so) billion year earth, and none points to a biblical flood. Your logic is flawed by suggesting that science uses a “long age philosophy”. It is wrong. Science doesn’t care how old the earth is, and doesn’t really care if there was a flood or not. Science uses EVIDENCE, and forms a view from having ample corroborating evidence. It does not suggest the earth is old and then looks to make the evidence to fit. Unlike creationist “theories” which all aim to match a biblical flood. And you do a poor job at it. Why not let students make up their own minds. Present the evidence, and also present your religion. You CAN have it both ways. Don’t change Powerpoints to match a biblical account. If you don’t understand the evidence, don’t make something up. When you say “Your’interpretation'” you imply that the billion-year scenario is also an interpretation, and in this you are correct. Further, you say, “let the students make up their own minds”, which is the whole point of the critique. The aim is to help students understand the difference between fact and fantasy. Then they can make an informed decision. I think it would be helpful for you too to learn to distinguish between fact and story-telling so you can be better informed. If you read the comments alongside each slide carefully you will develop that skill. Facts are things that can be observed and measured. Debate about facts can be settled because everyone can make the same observations and/or repeat the measurements. However, story telling comes from the story-teller’s imagination. Different people can tell different stories about the same facts. 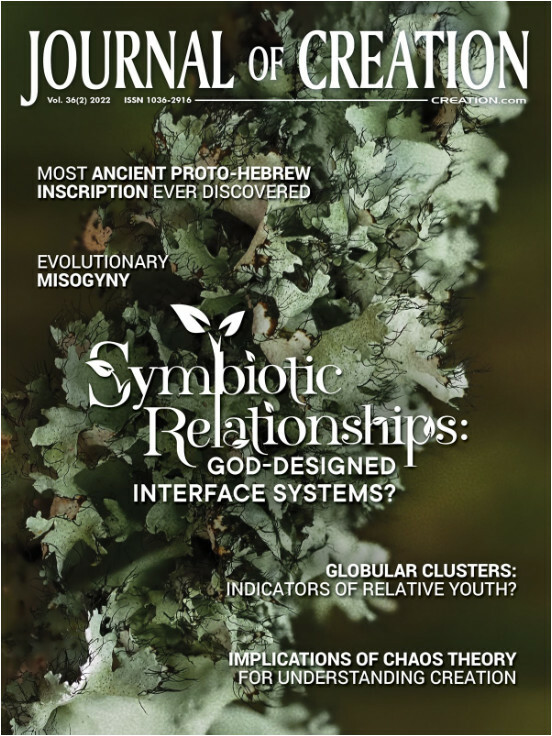 “child abuse”, mythological event”, “evidence suggests a 4.5 billion year earth”, “none points to a biblical flood”, “science does not care how old the earth is” or if there was a global Flood. These are all just wrong assertions which you have not properly investigated to determine the evidence on which the assertions are based, and how sound those assertions are.